Ahh, the NAS debate again. Jura Superstition was one of the first wave of NAS malts: whiskies created by combining a single distillery’s output from several different ages without revealing the ages on the bottle. 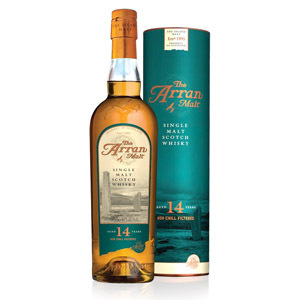 Along with Ardbeg Uigeadail and Aberlour abunadh, Superstition stands for the original intention of the category: to expand the ability of master blenders to release malts that showcase what’s best about a brand by allowing them to use young malt for intensity and fresh fruit and floral notes, and older malt for balance and depth. 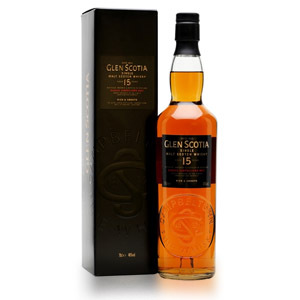 With an NAS expression, a distillery doesn’t have to try to sell something that has a price befitting its average age of, say, 15 years with a label that (by law) only reveals the youngest malt in the vatting – perhaps 5 years. It’s a laudable goal, but fraught with potential for abuse. Any old profit-driven distillery (cough) with an eye towards gouging the current spike in whisky popularity could release an $80 bottling of primarily young malt without any kind of legal backlash. In fact, when Compass Box recently tried to flip the system and release an NAS blend with the age of all of the components prominently displayed, it was slapped with threats of litigation. The NAS market is, certainly, one where the buyer must beware. 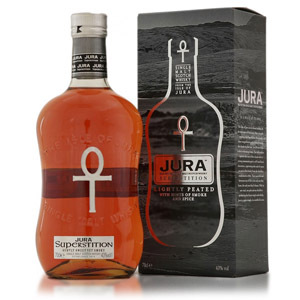 Superstition is Jura’s house malt but heavily peated (although the bottle says “lightly” peated, I would lump it in with fully peated malts like Laphroaig and Talisker) and aged in ex-bourbon casks. It’s quite reasonably priced, at $50 – $60, which is the new $40, didn’t you know? Nose: Strong, iodine-flecked peat. Briny and heavily suggestive of the sea (not smoke). Reminds me of expanses of brown seaweed slowly aging (rotting) on a sea spray-buffeted beach. 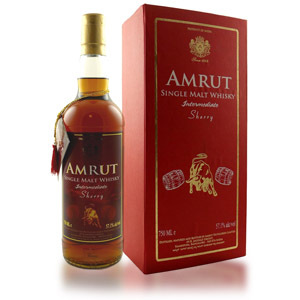 After a rest in the glass, one can pick out notes of sandalwood, vanilla, and caramel, although they are faint. Palate: Moderately creamy body. Some tongue burn is followed by salty peat with notes of black pepper. A light malt sweetness pervades, but is just sweet enough to balance the salt/peat. Finish: Of medium length. More of the same notes (salty peat). A hint of citrus creeps in as the peat fades, along with sweet Key lime. Pleasant. With Water: A few drops of water temper the peat, releasing notes of salted caramel and vanilla. The same notes appear on the tongue, improving the overall balance of the malt (unless you just love seaweed). Overall: First, I highly recommend water with this. 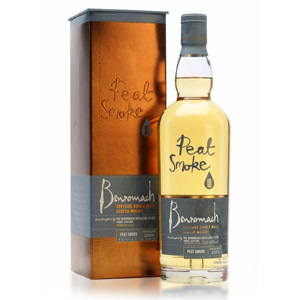 Water turns a one-dimensional oceanic peat show into a well-balanced orchestra of peat and oak and caramelized malt. Quite tasty, and more accessible (especially with water) than other peated standards like Laphroaig 10 and the pretty similar Talisker 10. At only a $10 premium over younger (unpeated) sibling Jura 10, it’s a no-brainer. If you’ve never had Jura or were worried about the possibility of an NAS scam, this is a solid Must Try. Acquired: (50ml sample bottle) from an Isle of Jura Tasting Pack. Woohoo!!! Stoked to try this! It would have been further down my list, but peated malts outside of the standard Islay fare are so much fun! I’m glad to see a review of this scotch confirming all what I experienced a few months ago. I was pleasantly surprised by it, found it very interesting and pleasant, recently found it for $46 in Colorado but my liquor cabinet is already full and I can justify adding another one at this point. This scotch almost strikes me as an unsung hero as nobody seems to know it and it is really worth trying. Yes I totally agree with you, this is such a awesomely easy to drink Scotch. I tried it in a tasting with other Islay Scotches. This is incredibly smooth and easy to drink. Love it. I also agree this Scotch is “very good” and a must try for everyone. I feel is does have a smokey taste in which I liked along with it’s smoothness. If I had read this review and never tried it before, not sure I would have bought a bottle based on the rotted seaweed comment along with Laphroiag 10. I personally do not think the “Peat” taste is nowhere near Laphroiag 10 peat intensity. Don’t let this discourage you, I think it is a very good tasting Scotch and you won’t be sorry for the try.